Stephen Grant - I want a comedy night! Stephen Grant is respected not only for his work ethic and versatility but also for being very, very funny. Whether it’s a feisty audience at a comedy club, a warm up for a TV audience or performing a bespoke set for a corporate awards evening Stephen never fails to pull in the laughs. 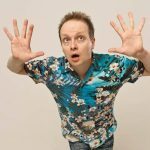 He has won the Chortle Awards ‘Best UK Compere’ twice now with the experience gleaned from his long running residency at Komedia, in his hometown of Brighton. He also regularly performs at London’s prestigious Comedy Store. When not doing all of the above he still finds time to perform at comedy clubs across the UK and abroad as well as writing for Rob Beckett on Mock the Week, for Russell Kane on Live at the Electric, Lee Nelson’s Well Good Show, Seann Walsh for Channel 4’s Stand Up For The Week and a virtual litany of one-liners for various Radio 1 DJ’s!